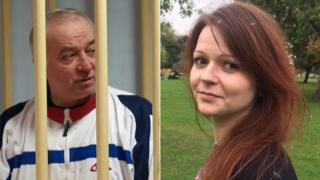 She said Foreign Secretary Boris Johnson had told the ambassador Moscow must provide "full and complete disclosure" of the Novichok programme to international body the Organisation for the Prohibition of Chemical Weapons. How could the UK retaliate? 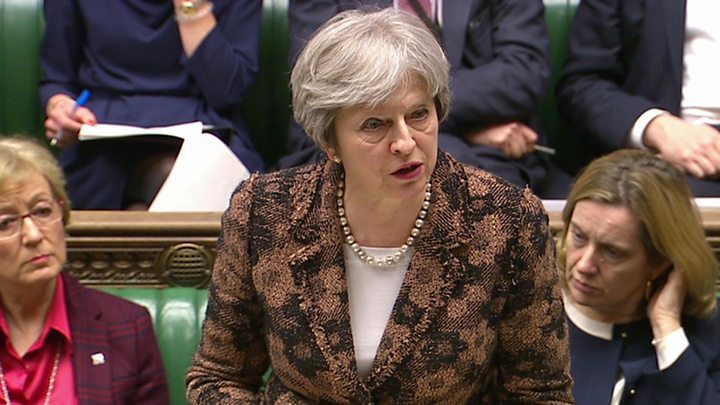 Addressing the Commons following a meeting of the government's National Security Council, Mrs May said: "This attempted murder using a weapons-grade nerve agent in a British town was not just a crime against the Skripals. "It was an indiscriminate and reckless act against the United Kingdom, putting the lives of innocent civilians at risk." She told MPs the positive identification of this chemical agent was made by experts at the UK's Porton Down laboratory. The decision to point the finger at Moscow was also based on "Russia's record of conducting state-sponsored assassinations and our assessment that Russia views some defectors as legitimate targets for assassinations", the PM added. 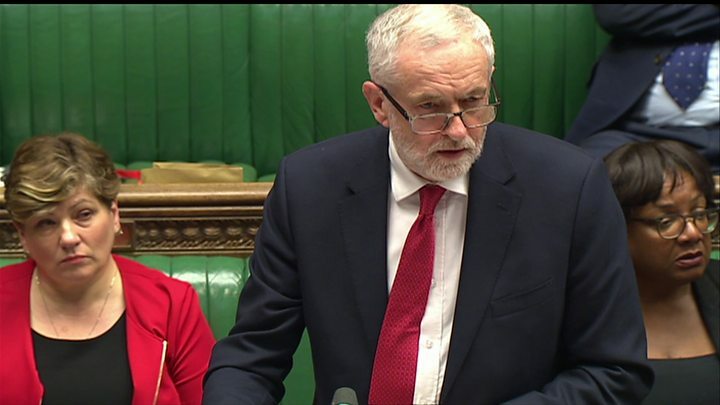 Media captionJeremy Corbyn urges action - but criticises the Tories for taking donations from "Russian oligarchs"
Labour leader Jeremy Corbyn said "robust dialogue" with Russia was needed to avoid escalating tensions further - but he was heckled by Tory MPs when he raised questions about Russian oligarchs donating money to the Conservatives. "We agree that those responsible - both those who committed the crime and those who ordered it - must face appropriately serious consequences," he added. Mrs May spoke to French President Emmanuel Macron on Monday and "discussed the wide pattern of aggressive Russian behaviour and agreed that it would be important to continue to act in concert with allies to address it", her spokesman said. Nato Secretary General Jens Stoltenberg said the use of any nerve agent was "horrendous and completely unacceptable" and officials were in touch with the UK. Downing Street said the incident was not an "article five" matter - a reference to Nato rules which say an attack on one member constitutes an attack on all. However, the former UK National Security Adviser Lord Ricketts said action would be more effective with a "broader, Nato-EU solidarity behind us". He added: "We can't out-punch Putin... But we can take a stand and we can invite others to join us." "The conclusion is obvious - it's another information and political campaign based on provocation," she said. 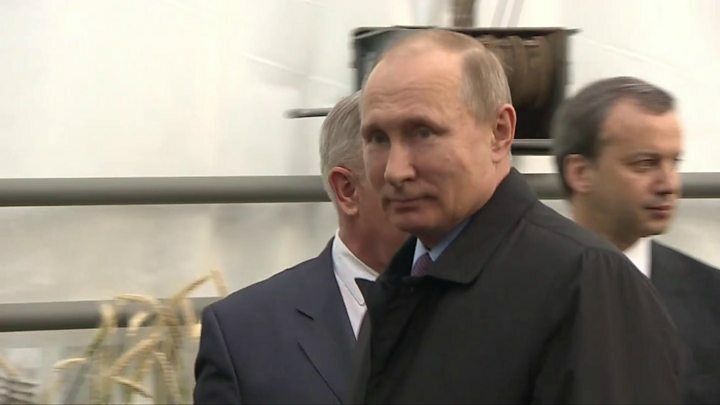 Earlier, asked whether Russia was to blame, President Vladimir Putin told the BBC: "Get to the bottom of things there, then we'll discuss this." BBC political editor Laura Kuenssberg says the tone of the meeting between Boris Johnson and the Russian ambassador Alexander Yakovenko was "cool but firm". She says the men did not shake hands and the foreign secretary expressed the "outrage" of the British public. Mrs May is promising "extensive measures" - the question will be whether they will be enough to make the Kremlin think twice. Police and Army activity continued in the Salisbury area on Monday, with officers - some wearing hazardous materials suits - removing a white van from the village of Winterslow, about six miles away. A Sainsbury's car park has become the latest area to be sealed off in the city itself. Mrs May said the people of Salisbury had responded with "fortitude and calmness", but there was some concern among residents about the length of time it had taken for information to be released. Graham Mulcock, who saw the Skripals being treated by paramedics in the street, said it was a "disappointment" that advice which "might affect people" was not released sooner. Former chief medical officer for England, Sir Liam Donaldson, said he had also been a "little surprised" that communication with the public had been "slow to get off the ground".